Western blot analysis of extracts from various cell lines, using Rictor Antibody. 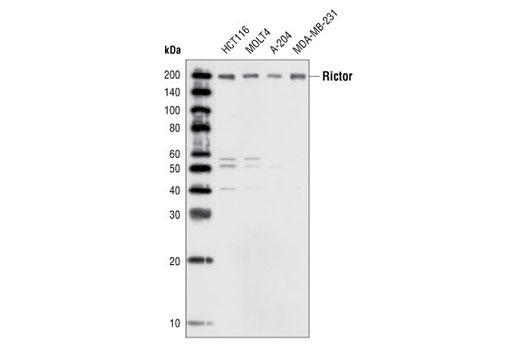 Rictor Antibody detects endogenous levels of total rictor protein. Polyclonal antibodies are produced by immunizing animals with a synthetic peptide corresponding to residues surrounding Lys1125 of human rictor. Antibodies are purified by protein A and peptide affinity chromatography. Cell growth is a fundamental biological process whereby cells accumulate mass and increase in size. The mammalian TOR (mTOR) pathway regulates growth by coordinating energy and nutrient signals with growth factor-derived signals (1). mTOR is a large protein kinase with two different complexes. One complex contains mTOR, GβL and raptor, which is a target of rapamycin. The other complex, insensitive to rapamycin, includes mTOR, GβL, Sin1, and rictor (1). The mTOR-rictor complex phosphorylates Ser473 of Akt/PKB in vitro (2). This phosphorylation is essential for full Akt/PKB activation. Furthermore, an siRNA knockdown of rictor inhibits Ser473 phosphorylation in 3T3-L1 adipocytes (3). This complex has also been shown to phosphorylate the rapamycin-resistant mutants of S6K1, another effector of mTOR (4). Sarbassov, D.D. et al. (2004) Curr Biol 14, 1296-302. Hresko, R.C. and Mueckler, M. (2005) J Biol Chem 280, 40406-16.